It won’t be exaggeration to say that the national cuisine is considered to be a brand identity of Uzbekistan. You can hardly find such a variety of dishes anywhere else. Definitely, the first dish that is associated with Uzbekistan is pilaw (plov). Just pilaw itself has several dozens of recipes. The peculiarities of the recipe depend on the region in which you will taste this dish. So, there are Tashkent, Samarkand, Bukhara, Khorezm, Fergana and other types of pilaw and each has its own identity. In 2017, a festival was held in Tashkent city, whereon a family of hereditary cooks surprised the world with the preparation of a giant cooking pot of pilaw weighing 8 tons. This event was unprecedented, and the pilaw-record holder was entered the Guinness Book of Records. Cultural feature: traditionally in Uzbekistan professional cooks are always men. In recent years, in Tashkent there have been opened many restaurants, whose building is decorated with the inscription: "Milliy Taomlar" ("National dishes"). In essence, this is a modern canteen, where you can always have lunch or dinner for acceptable prices or just have tea with friends. It should be noted that in the last decade this modern analog of public catering facilities has undergone qualitative changes now possessing such features like: delightful for the eye oriental design, a respectable level of the service quality, reasonable prices, and the most important - it’s really delicious here. In most of such kind of establishments you can personally observe the preparation of dishes in huge cooking pots. If you are interested in aesthetics, a special atmosphere, then you can use the services of the restaurant networks, art cafes which are not only within the city, but also in the mountain area. A fresh cool air, far from glass city buildings and city bustle, quiet, unobtrusive beautiful background music, combined with fine cuisine, will forever leave you the impression of being in an ancient eastern fairy tale. Mastava - soup, the main components of which are rice and finely chopped meat. Shurpa – soup with meat, potatoes, onions and a little carrot. Pilaw is probably the most famous of oriental dishes. The main ingredients are rice, carrot, meat, onion. Spices and vegetable herbs are used to give special flavor tones. It can be: zira, coriander, dried tomatoes, dried red sweet pepper, dried green hot pepper, saffron, black pepper, garlic. Kish-mish (dried grapes) and nachot (peas) are also added. Pilaw can be tasted in any establishment where national dishes are prepared. There are also pilaw centers specializing in cooking this particular dish. Gampan - boiled rice with vegetables and meat (sai). The dish came from Uighur cuisine. You can order rice and vegetables together or separately (ayrimsai). Shavlya - dish similar to pilaw, consisting of the same basic ingredients - rice, meat, and carrot. It differs in that it is softer and mushy due to a greater addition of water. Moshkichiri - "mache porridge". Ingredients: mache mixed with rice and pieces of beef or mutton. Dimlama - stew with vegetables and meat (cabbage, turnip, carrots, potatoes). Dolma - rolls, made from leaves of grapes and minced meat. Lagman - long noodles with vegetables and meat (sai). There are two kinds - lagman itself, or as it is called Uigur (Uigurcha) lagman, and also kovurma lagman, characterized in that noodles are fried here, while in the usual lagman noodles are boiled. A real lagman should not be overboiled, so vegetables retain their natural color and remain crisp. A smell of fire, a light smoked taste gives a special flavor to the dish. Naryn - dough is boiled in layers, finely chopped and mixed with small pieces of horse meat or lamb. Served with bouillon, slices of horse sausage (kazy) and onion. Chuchvara - dumplings, usually served with soup. In addition, the analogue of the Uyghur cuisine - juvava is popular. Kabob, or shish kebab - shish kebab in Uzbekistan is also characterized by a variety of species. You can try shish kebab from beef or mutton meat, chicken. There are the following types of preparation: jazz (lump), kiyma (minced), jigar (shish kebab from the liver). Kovurchok - "roast", fried meat, potatoes. Manti - thinly rolled up dough, with meat inside. Looks like a dumplings, but larger in size and steam-prepared. Khanum - meat, potatoes or pumpkin wrapped into dough in the form of a roll. Achchik-chucuk - salad, made of tomatoes, onions and cucumbers. Sometimes it is sprinkled with black pepper (to taste). Shakarob - salad for pilaw or roast, prepared from tomatoes, onions, black or pod-peppers. Gumma - small patties with giblets, fried in oil. Samsa - pies with beef, chicken, pumpkin, potatoes or greens. They are cooked in a special oven - tandyr, or in the cooker oven. Hasip - a natural sausage made of minced meat (beef or lamb) boiled with rice. Kazi - a natural sausage made of horse meat, sometimes with the addition of beef. Obi-non - baked on plain water. Katlama non – flat cakes, which are prepared from a roll-in dough. Patyr non – flat cakes, cooked with the butter (sometimes adding fat) and milk. Yupka non - like katlama non, it is bread from thinly rolled out dough, but here a minced meat is added between the layers. Katyk - kefir, which is made from natural boiled milk. Suzma - cultured milk product, similar to cottage cheese, which is obtained with the decanting of the katyk. Kurt - pieces of dried suzma of different shapes (usually round) with the addition of various spices. Ayran (or chalop) is a refreshing drink obtained by diluting katyk with water or milk. Nawat is Uzbek natural sugar, which has a crystal-like appearance and an amber color. It promotes balance recovery in the body. Often served with tea after pilaw. Parvarda - sweets in the form of pillows, sprinkled with flour. Pashmak - sweets in the form of small balls of sweet floury fibers. Halva - the common name for the eastern kind of dessert. There are different types made of seeds of sunflower, sesame, flour and sugar (halvaitar). In addition, local types of halva are known, for example, Kokand halva. Nishalda is a sweet white mass made from whipped egg whites, sugar syrup and a licorice or soap root. Pastry straws - thin dough fried in oil. Top of it is usually sprinkled with powdered sugar. Chak-chak - a famous delicacy, known not only among the Uzbek, but also among the Tatar people. Fried pieces of dough covered with honey syrup. 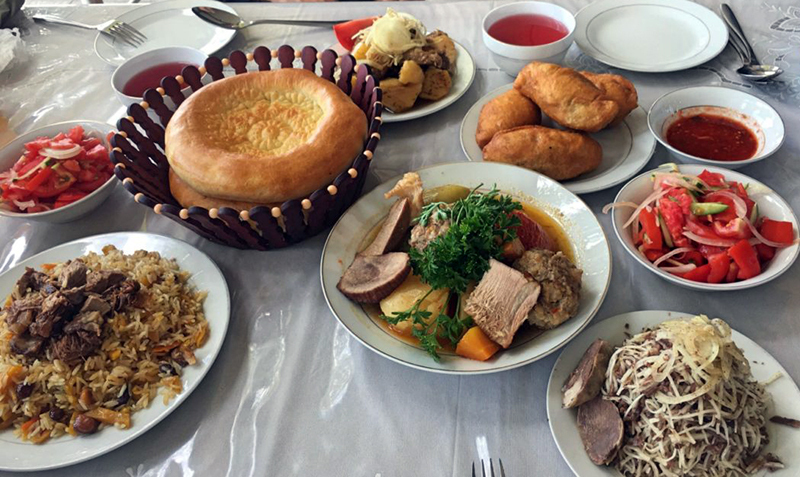 In general, if we talk about cuisine, Uzbekistan is the country where people, undoubtedly, understand the real taste of good food.